Higher education is associated with a reduced risk of developing heart failure after a heart attack, reports a study in more than 70 000 patients published today in the European Journal of Preventive Cardiology. The current study investigated the association between educational level and the risk of developing heart failure after an acute myocardial infarction (AMI). The study included 70 506 patients aged 35 to 85 years who had been hospitalised with a first (incident) AMI during 2001 to 2009 and did not have a history of heart failure. Patients were identified from the Cardiovascular Disease in Norway (CVDNOR) project, which contains data on all hospital stays with a cardiovascular disease-related diagnosis in Norway since 1994. Information on the highest attained education level was obtained from the Norwegian National Education Database. Education was categorised as primary (up to 10 years of compulsory education), secondary (high school or vocational school), or tertiary education (college/university). Patients were followed for an incident episode of heart failure until 31 December 2009. Based on its timing in relation to the incident AMI, heart failure was classified into two mutually exclusive categories; early-onset (heart failure on admission or developing during the hospitalisation for the incident AMI) and late-onset (either a new hospitalisation with heart failure or death due to heart failure after discharge from the incident AMI hospitalisation). 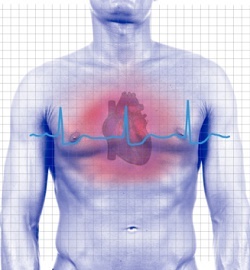 Separate analyses were conducted for early and late-onset heart failure. Of the 70 506 patients included in the analyses, 17.7% were diagnosed with early-onset heart failure. Patients with secondary or tertiary education had respectively 9% and 20% lower risk of heart failure compared to those with primary education. Another 11.8% of patients were diagnosed with late-onset heart failure during an average follow up time of 3.4 years (interquartile range 1.5 to 5.9 years). Patients with secondary or tertiary education had respectively 14% and 27% lower risk of heart failure compared to patients with primary education. When analyses were restricted to patients who received coronary revascularisation to clear blocked arteries after their AMI, those with secondary or tertiary education had respectively 16% and 33% lower risk of late-onset heart failure compared to those with primary education. Educational differences in the risk of early-onset and late-onset heart failure were similar in men and women.